The Professional Regulation Commission (PRC) has already announced the results of August 2014 LET (Licensure examination for Teachers) also known as teachers board exam. PRC and its regional offices now inform 25,301 elementary teachers and 26,767 secondary teachers (LET Passers) for their schedule and venue of registration, oathtaking schedule as well as verification of ratings page. View the complete results of August 2014 LET here. PRC Manila announced that registration for the issuance of Professional Identification Card (ID) and Certificate of Registration will start on November 5, 2014. 5) the Initial Registration Fee of P600 and Annual Registration Fee of P450 for 2014-2017. As results were released online on Monday, October 27, 2014, PRC said that the dates and venues for the oathtaking ceremonies of the new successful examinees in the said examination WILL BE ANNOUNCED LATER. 1. PRC Baguio - PRC Baguio said that registration starts on November 3, 2014 (Monday). Details here. 2. PRC Manila - Initial registration starts on Wednesday, November 5, 2014 at the PRC-Registration Division (PRC Main Building, Manila). Details here. 4. PRC Cebu - Registration for the new passers of teachers board exam starts on November 18. 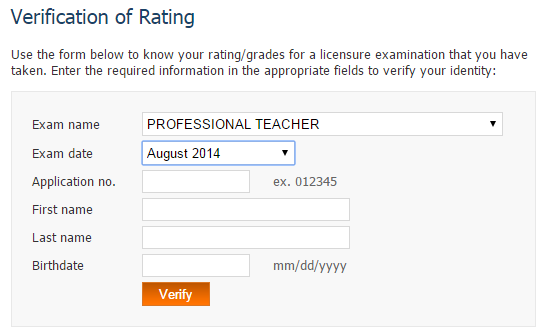 PRC online verification of ratings (VoR) page for August 2014 Licensure examination for teachers (LET) is now available. Select the Exam Name (Professional Teacher) and Exam Date (August 2014).